( Zincite ) and Octyl Methoxy Cinnamate. Rutile and Zincite exist naturally in soil and are extremely unlikely to cause any adverse skin reaction. Rutile and Zincite physically reflect the UV Rays and both offer Broad Band UV A and UV B protection. Rutile and Zincite are not broken down by sun rays. Octyl Methoxy Cinnamate has been used worldwide for 20 years plus in baby sunscreen formulations and is used for its excellent water resistance and UV B absorbing capabilities. Octyl Methoxy Cinnamate has a synergist effect with the mineral UV absorbers and is only used in low concentrations as a water resistant UV absorber. 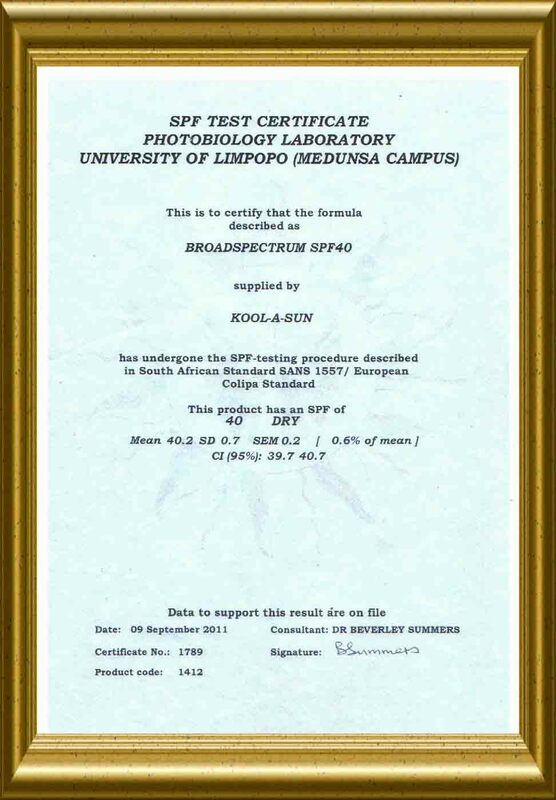 All the UV blockers are approved worldwide for use on adults and children 6 months and older. The Sunblock is non-irritating and is fine for use on the face and on Sensitive Skin. The base cream is a hypo-allergenic moisturising water and light oil emulsion, with Vitamin A, C and E added to cream. Vitamin A , C and E are known as free radical scavengers ( anti-oxidants ). Free radicals are the main culprit for the skin losing its elasticity and aging. Bulbinella Plant extract is also added as a skin conditioning agent. Our formulation as been checked by SMI Analytical Laboratories for any harmful trace contaminants and for long term skin usage. Each batch of raw materials is sourced from reputable suppliers and all batches are laboratory verified. Our products have been tested on human volunteers; we do not test our products on animals. Aqua, Cetearyl Alcohol, Zinc Oxide, Titanium Dioxide, Glycerine, Octyl Methoxy Cinnamate, Cellulose Gum, Xanthan Gum, Soft Wax, Glycerol Stearate, Vitamin C, Vitamin E , Vitamin A, Phenoxy Ethanol and Bulbinella Plant Extract. Apply a generous layer on to sun exposed areas of the skin. Allow 2 to 3 minutes for skin absorption. After absorption, Product leaves a non greasy ivisible protective layer on your skin. Re-Apply after swimming and toweling. Re-Apply after strenuous exercise and excessive sweating. For best results and for fair skinned people it is recommended to apply 2 layers of Sunblock 15 minutes apart before sun exposure to avoid any risk of sunburn. 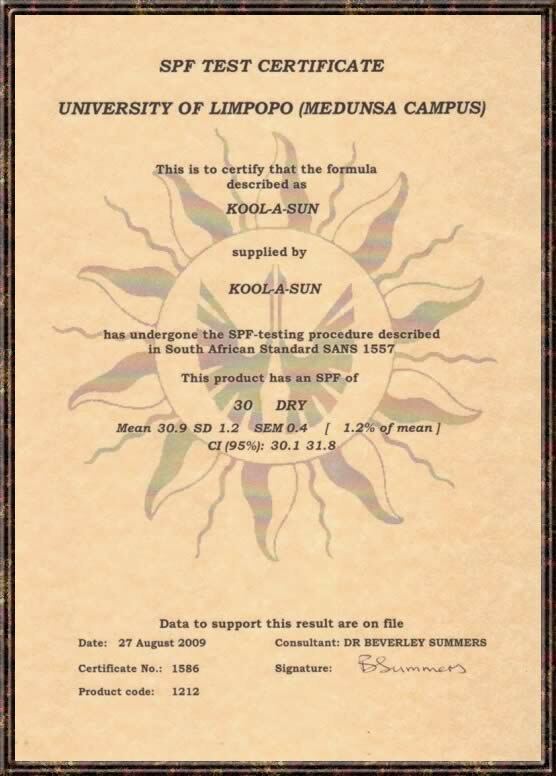 Ingredients in our Sunscreens and Sunscreen specifications.